A new report on the land market shows that land prices increased in 2013 with land in Munster and Leinster seeing the largest increases. Activity levels are also up 5% in the first quarter of 2014 according to the report, which was compiled by the Society of Chartered Surveyors Ireland (SCSI) and Teagasc. According to the report, the average national price for land up to 50 acres with entitlements and a residential holding per acre is approximately €10,721. In Dublin it is €13,000. In Leinster, it is €11,132, in Munster, it is €11,378 and in Connaught/Ulster it is €7,375. 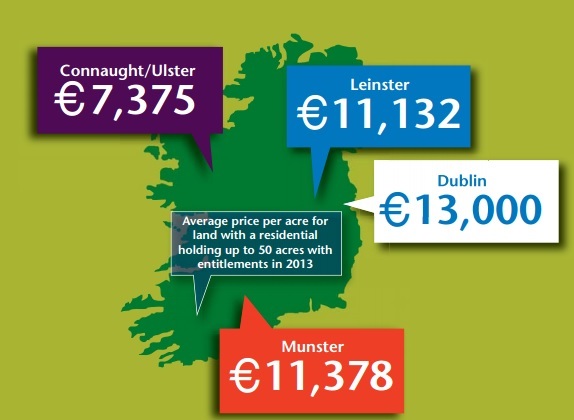 The largest increase in land prices was seen in the Munster area, where the average selling price in 2013 increased by 14.3% for land up to 50 acres with a residential holding. In Leinster prices increased by 13.9% and in Connaught/Ulster they increased by 2%, compared to the previous year. In contrast to the smaller land transactions (up to 50 acres), price movements were negative in 2013 in the case of larger (over 100 acres) sales with entitlements and without a residential holding. The largest percentage drop occurred in the Connaught/Ulster region, where land prices declined by approximately 13% year on year. 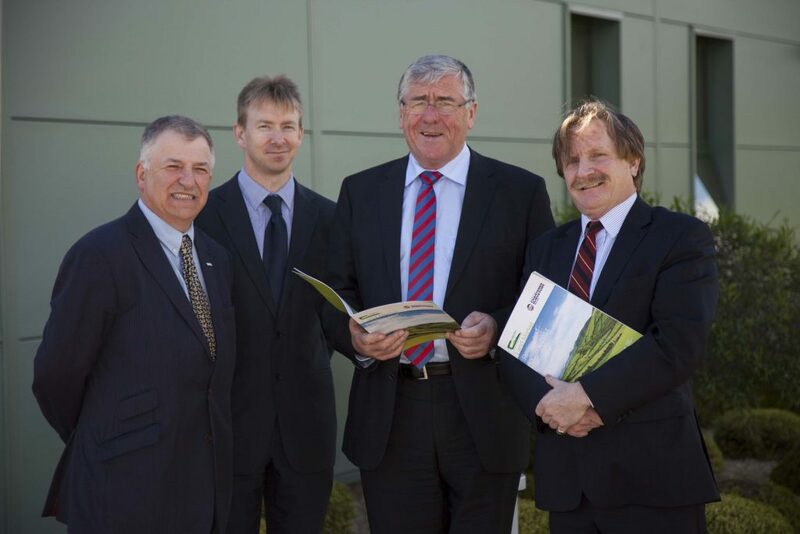 Minister of State at the Department of Agriculture, Food and the Marine, Tom Hayes welcomed the publication of the SCSI/Teagasc Land Market Report and said: “Food Harvest 2020 sets out ambitious targets for agriculture in Ireland and many producers’ expansion plans will no doubt include decisions about the purchase or rental of land and it is therefore timely that this report has been published”. The report notes that lower feed and fertiliser prices, together with a reduction in the volumes of these inputs, mean that overall costs of production are expected to decline in 2014. While it was expected that beef prices would improve in 2014, market movements in the first quarter of the year now make this prospect less likely. Nevertheless, with lower costs of production on most farm types, farm incomes in 2014 are forecast to increase by 13% on average. 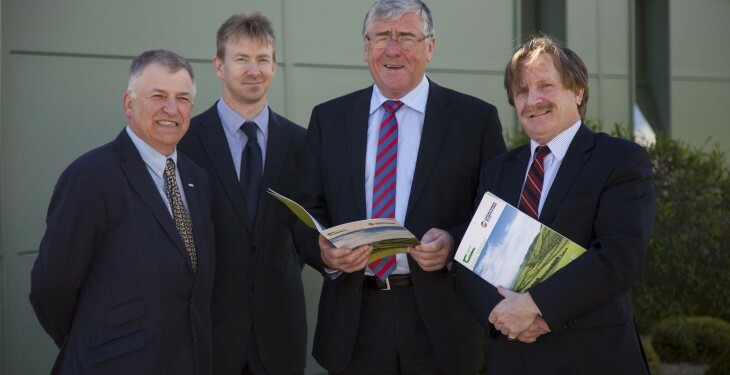 Trevor McCarthy, Chairman of the Society of Chartered Surveyors Ireland (SCSI) Rural Professional Group said: “In order to meet the increased output targets of 50 per cent increases in milk production in Food Harvest 2020, new dairy farms will need to be established. Clearly this has implications for the land market and it is imperative that the supply issue is addressed. According to the report, the volume of land which came to market increased by just over 4% on the previous year. The current level of land transfer for sale is, however, minimal with just 0.5% of all land transacted annually. This lack of supply is becoming an issue, particularly in the context of Food Harvest 2020 and we hope that measures to improve land mobility are considered by Government”. Mr. McCarthy also pointed to the challenge for farmers in accessing finance “The majority of purchasers of agricultural land are farmers and their ability to access finance remains constrained and highly sensitive to wider economic factors. This means their purchasing power can often be impacted by fluctuations in commodity prices” Mr. McCarthy concluded.